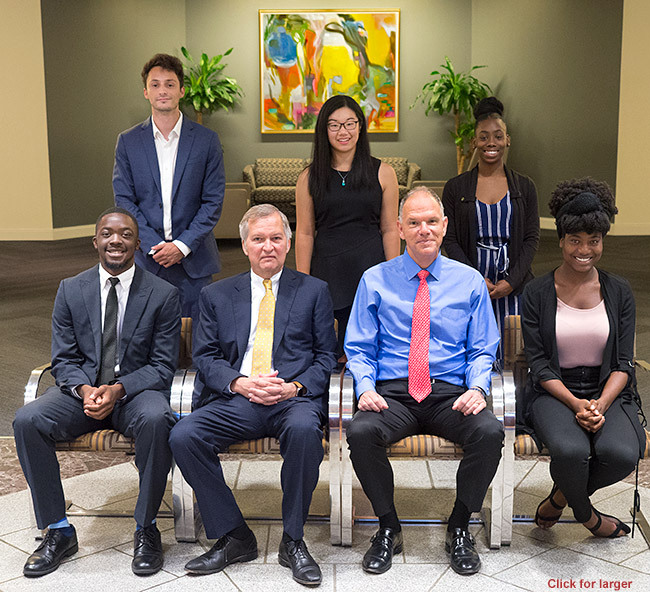 Wharton School Deputy Dean and Dean, Michael Gibbons and Geoffrey Garrett, meet with five of the six 2018 SUMR scholars sponsored by the Dean's Office. 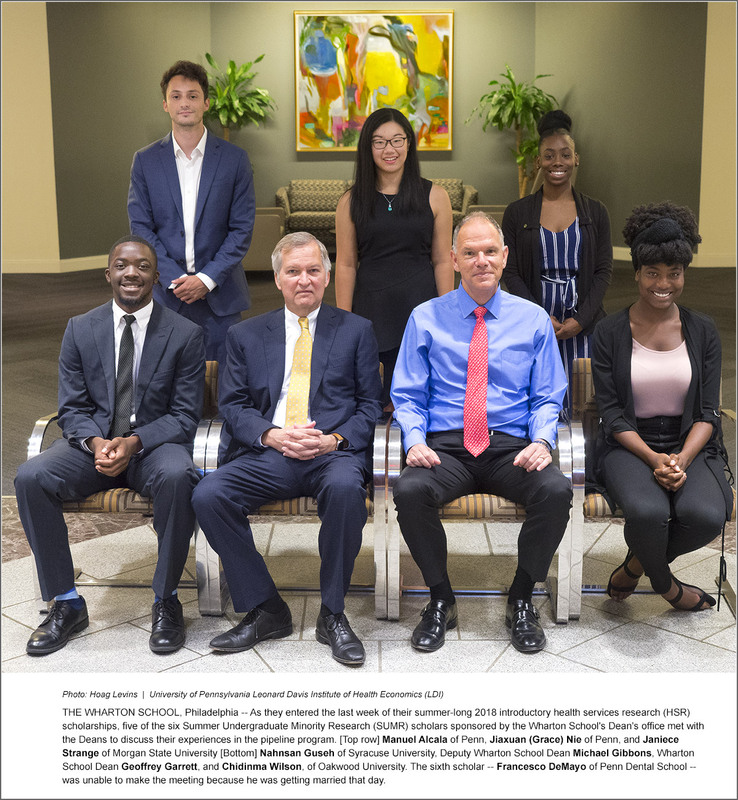 As they entered the last week of their summer-long 2018 introductory health services research (HSR) scholarships, five of the six Summer Undergraduate Minority Research (SUMR) scholars sponsored by the Wharton School's Dean's office met with the Deans to discuss their experiences in the pipeline program. [Top row] Manuel Alcala of Penn, Jiaxuan (Grace) Nie of Penn, and Janiece Strange of Morgan State University [Bottom] Nahnsan Guseh of Syracuse University, Deputy Wharton School Dean Michael Gibbons, Wharton School Dean Geoffrey Garrett, and Chidinma Wilson, of Oakwood University. The sixth scholar -- Francesco DeMayo of Penn Dental School -- was unable to make the meeting because he was getting married that day. The six were part of the larger SUMR cohort of 23 scholars from 16 different universities that spent three months on campus. 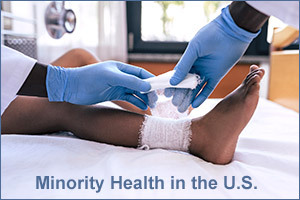 Sponsored by Penn's Leonard Davis Institute of Health Economics (LDI) and the Wharton School Health Care Management Department, the annual SUMR program is aimed at underrepresented minority undergraduates and others interested in exploring potential careers in the field of health services research (HSR). During that period they received intensive HSR orientation at the same time each is paired with one or more faculty mentors directly engaged in an ongoing HSR research project. Penn Mathematical Economics senior Manuel Alcala participated in a research project mentored by Wharton Health Care Management Associate Professor Claudio Lucarelli, PhD. Penn Health Care Management junior Grace Nie participated in a research project mentored by Wharton Assistant Professors Ashley Swanson, PhD, and Matthew Grennan, PhD. Morgan State University Business Administration senior Janiece Strange participated in a researech project with Rachel Hadler, MD, Assistant Professor of Anesthesiology and Critical Care at Penn's Perelman School of Medicine. Syracuse University Public Health senior Nahnsan Guseh participated in a research project mentored by Wharton School Professor Emeritus of Legal Studies and Health Care Management Arnold (Skip) Rosoff, JD. Oakwood University Biomedical Sciences senior Chidinma Wilson participated in a research project mentored by Wharton Assistant Professor Stephanie Creary, PhD. Penn Dental School DMD candidate Francesco DeMayo participated in a research project mentored by Young Hee Nam, PhD, of the Perelman School of Medicine.